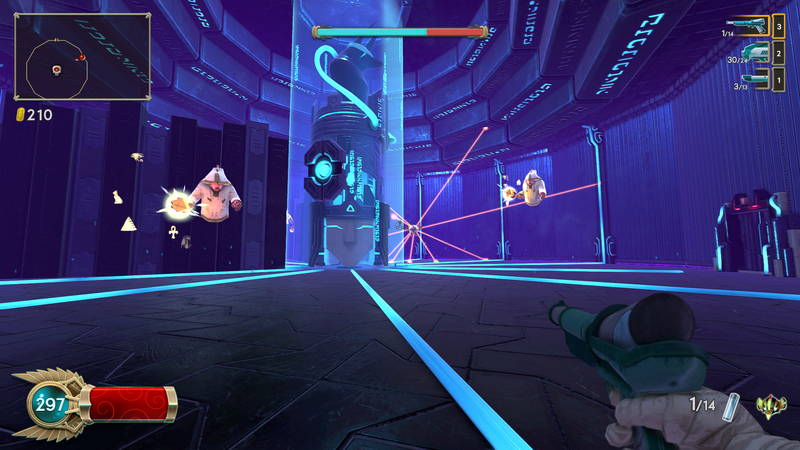 Arcade first-person shooters aren’t too common these days, but they do fill a void in the gaming landscape. Immortal Redneck by CremaGames is one such game. Set in Egyptian lore but with a seemingly unrelated title, this fast-paced first-person shooter with rogue-like (or rogue-lite) elements promises to challenge the player while remaining fun and fair. Does the game serve up the fun with its procedural room generation, or does its randomness hurt its case for your money? The story in Immortal Redneck is pretty light. Essentially, a stereotypical “redneck,” straight from Kansas, is vacationing in Egypt. He quickly finds himself flying off a cliff in his dune buggy, where he slams into the sand and is kidnapped and turned into a mummy by entities unknown. Now, this unnamed redneck mummy is out for revenge, and has a large assortment of weapons with which to enact it. Immortal Redneck utilizes the Unity engine. It appears to be highly optimized, though, and it is obvious that this isn’t Crema Game’s first rodeo of games development. The action stays fast and furious, no matter the number of enemies or effects on screen. Some room also contain dozens of physical hazards, such as giant swinging blades all swinging in unison, without causing the engine to trip up. There are also unspecified upgrades to the presentation on the PlayStation 4 Pro, which probably includes 4K output and higher-resolution textures. The environment and enemies are excellently detailed, with good lighting effects throughout. Ancient Egyptian lore is all about the many deities which controlled various aspects of the world in that mythology. In Immortal Redneck, the eight gods and goddesses (plus the redneck) represent different classes, each with varying attribute bonuses, as well as passive and active abilities. There are some creative abilities, such as summoning a decoy which is a log dressed up as a person, and other useful options like turning all enemies in the current room into health pickups. Most of the deities must be unlocked by spending coins picked up on each playthrough, as a branch of Immortal Redneck’s skill tree. This skill tree is an actual tree, which grows as new abilities are unlocked. This aspect fits right in with the rest of Immortal Redneck’s sense of humor, and actually packs a few dozen skills, most of which can be upgraded by spending some coins. Upgrading health and defensive stats in the beginning hours of the campaign are a must, because health pickups are a rare commodity inside the pyramids. In between playthroughs, any gold earned from the previous life can be spent on either the aforementioned skills, or a merchant once he is unlocked. Defeating bosses can grant access to special tokens, which start the next pyramid as if that boss had just been defeated. A repeat of the last pyramid can also be requested, for a hefty fee and the disabling of collecting any gold on the next playthrough. Any unspent gold is relinquished in sacrifice to the gods, in order to start another attempt at clearing a pyramid. Randomness (or, rather, pseudo-randomness) is often used for rogue-likes in order to guarantee that each playthrough is a unique adventure. Immortal Redneck randomizes the layout of each pyramid entered, as well as power-ups encountered. Each pyramid consists of a number of floors, the layout of which consists of a randomized assortment of individual rooms. The rooms lock the player in upon entry, unlocking only after all enemies are cleared, or if the challenge is either passed or failed in the case of special challenge rooms. Once a particular room has been encountered, any future encounters will contain exactly the same types and number of enemies, which can help to inform the player of strategies to use. However, enemies can randomly drop new weapons or scrolls. The player can only hold up to three weapons (though one class can carry four), so occasionally one weapon must be left behind. Immortal Redneck boasts over 50 weapons, from the traditional shotgun to mystical weaponry, the latter of which have unlimited ammunition but don’t do much damage, and are also slow to fire. It will take at least a few dozen playthroughs to see all the weapons on offer. Where things get interesting is in Immortal Redneck’s randomized scroll system. Some rooms contain chests, which will usually spit out scrolls. Enemies can also randomly drop scrolls as well. These scrolls contain game-changing modifiers, which remain in effect until the player dies. Most of these scrolls are helpful, such as increasing damage or turning enemies into chickens when shot. However, some scrolls are debuffs, which can do things such as limiting the player to only switching weapons when their current one is out of ammunition or reducing speed. All scrolls look the same before they are picked up, and must be kept for the duration of the current session. It’s an entertaining system that works pretty well, and keeps things interesting. Rogue-like games are usually fairly challenging. Not necessarily in the difficulty of individual enemies, but in the length of time required to play in order to make any real progression, as countless enemies whittle down the player’s health over time. Immortal Redneck follows in this tradition. Each of the game’s three pyramids feature a particular theme of Egypt, with dozens of enemy types out for blood. While each enemy is pretty easily dispatched, since there are many of them and few health pickups (which come in the form of chunks of meat), the challenge comes in avoiding even small hits while taking out enemies. 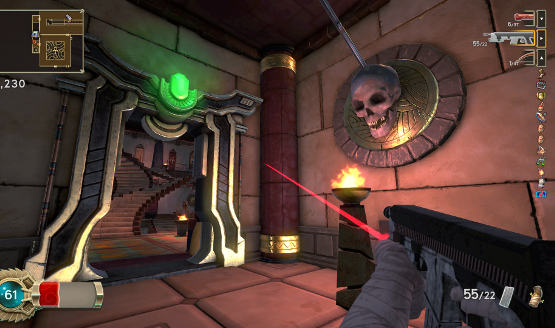 Many enemies can shoot projectiles, and in certain rooms Immortal Redneck has glimpses of bullet hell. Each pyramid contains a couple of bosses, which must be cleared to enter the next floor or clear the current pyramid. These are very tough bosses, which require quick reactions and even some puzzle solving in order to pass. Expect to die on the first encounter with these characters, as learning is a big part of the challenge in rogue-likes. The enjoyment that someone might get out of Immortal Redneck relies upon their tolerance for repetition. While each pyramid has a randomly-generated layout, the individual rooms are pre-made and even include the same kinds and number of enemies each time they are played. For some, this repetition will feel boring after seeing the same room a handful of times. Others understand that part of rogue-like games involve grinding it out and playing similar, but slightly different dungeons (which is effectively what these pyramids are, after all). Again, the random scrolls do spice things up, and trying to run through a pyramid with modifiers such as explosive jars, low gravity, and unlimited ammunition will be a varied enough experience to keep many seeing it through until the end. Immortal Redneck is ultimately a simple, fun game that is hard to master. Constantly replaying the same pyramid in order to progress sounds repetitive on the surface, but randomizing various key aspects changes things up enough to ensure the trip stays varied. Tongue-in-cheek humor with some of the weapons, but especially on literal objects such as the skill tree, help to dial down some of the frustrations of grabbing the occasional bad random scroll. All of this is packaged up in a sleek, cheap ($19.99) download and buttery-smooth, consistent frame rate that keeps the action going. Immortal Redneck is a good buy for those looking for a challenging arcade shooter that keeps things fresh. Immortal Redneck review copy provided by publisher. Version 1.00 reviewed on a PS4 Pro. For more information on review scores, please read our Review Policy.